Realization : Development, industrialization then mass production of an omnidirectional self-guided mobile base supporting a 3D radiology system. Proven expertise in robust and precise guidance. 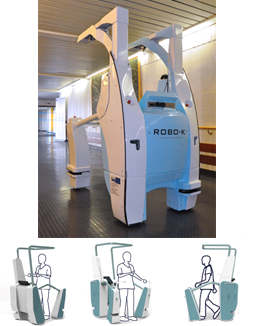 Equipped with a controlled suspension system, ROBO-K helps limit the patient’s fatigue and speed his recovery. 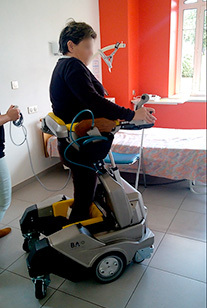 Realization: Design, production then tests of an autonomous device for gait rehabilitation. Risks reduction of Musculoskeletal disorders (MSDs) for the medical staff. Setting up and management of the collaborative project. Individual vehicle for conveying people upright. Self-balanced, it is intended for people with reduced mobility aiming at facilitating their autonomy. Realization: Design and implementation of an individual transport vehicle in a standing position with assistance for the sitting/standing passage for elderly or disabled people. An electric vehicle able to function inside and outside. Design, integration and realization of a device for the autonomy.